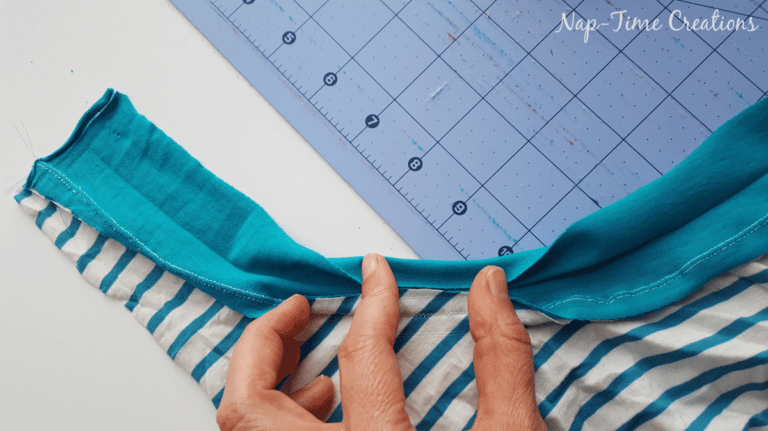 If you're looking for a fun Summer pattern that will keep you cool and comfortable throughout the warmer months, look no further than this FREE Women's Romper Pattern from Emily of Life Sew Savory, originally Nap-Time Creations. Designed to be sewn in light weight knits, this loose fitting romper is oh so cozy and chic. Click here for the entire tutorial and sewing pattern, and happy sewing! What I love about Emily's tutorials is that they are so easy to follow. She provides thorough step by step instructions that pair with clear images to walk you through the whole garment. Below she is demonstrating how to attach the binding around the neckline.